1. The only reason to sit Jared Goff as a rookie is if the Rams think he could get permanently damaged (physically or mentally) playing behind what’s been a porous offensive line. Los Angeles’s other quarterback, Case Keenum, isn’t a guy a team can tread water with. He is small and limited in arm. Goff played as a freshman at Cal and took a lot of lumps. He’d tell you now that experience benefitted him in the long haul. People fear a repeat of Tim Couch or David Carr when it comes to No. 1 drafted quarterbacks being battered as rookies. But remember, Troy Aikman, Jim Kelly, Phil Simms and Andrew Luck also fall into this category. 2. Left tackle Greg Robinson is the Biggest NFL Bust That Nobody Talks About. Robinson struggles mightily with his anchor in pass protection. When a 6-5, 332-pounder can’t hold ground, you know his technique is flawed. The Rams are razor thin at tackle and so Robinson’s job is secure this year. But if he doesn’t polish up, it won’t be next year. 3. Todd Gurley has the subtlest change of direction ability you’ll ever see. It’s so smooth and natural that it’s hard to notice. This allows Gurley to slither through small cracks and also maximize the blocks he sets up. Remarkably, it doesn’t compromise his power, either. The 227-pounder consistently finishes runs with authority. • RUNNING BACK RANKINGS: Peterson, Gurley and all your favorites are right here in the top 75. Plus, why your league should stop requiring two starting RBs anyway. 4. Without Tavon Austin, the Rams offense would be completely flavorless. The Rams are a run-based team with a below average O-line. They’re bereft of playmakers at wide receiver and tight end, and so their passing game must be highly schemed, with guys getting open through route combinations and play-action. 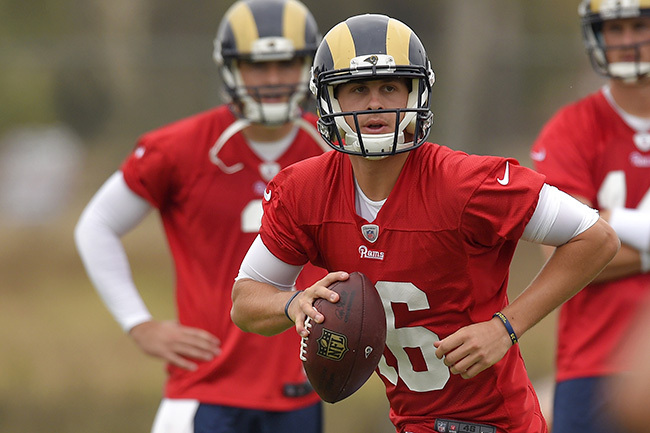 Their quarterback will likely be either untested (Goff) or untalented (Keenum). It’s an awful combination for first-time coordinator Rob Boras to deal with. The saving grace is Austin’s ability to threaten defenses horizontally and vertically. The Rams do a good job of leveraging this, be it either directly (Austin’s touches) or indirectly (his decoy action on ghost reverse action and fake handoffs or screens). There’s no real season Goff shouldn’t start in Week 1. 5. Los Angeles’s D boasts the best front four in football. You know about Aaron Donald, the game’s most explosive defensive tackle. Robert Quinn, when healthy, is the speediest, most pliable edge rushing end in the league. And then there’s the overlooked Michael Brockers, who does all the dirty work. His phone booth strength is matched only by his initial get-off, which is tremendous. 6. Rams defensive coordinator Gregg Williams is very committed to having a high volume, complex system. Most schemers with a dominant front four would just play 4-3 zone and hope to force sacks and turnovers. But Williams deploys a variety of different fronts, including a lot of “odd” fronts out of dime, with Donald (and sometimes Brockers) serving as what amounts to a pass rushing nose tackle. On the back end, Williams likes to rotate coverages and bring disguised blitzers from the second and third levels. There’s a debate to be had about whether all this is worth the trouble; when you’re complex, your players have more mental rigors to handle. But Williams, with this M.O., has had a lot of success over the years, including a Super Bowl title with the ’09 Saints. That Saints D had some limitations in the secondary that Williams hid with by blitzing. You can expect to see more of that from Williams here; the Rams secondary is not as strong as it was a year ago. 7. The biggest reason the above statement is true is the loss of centerfielder Rodney McLeod (to Philadelphia in free agency). His departure created the most glaring new hole in any NFL roster this past offseason. 8. The Rams were wise to choose cornerback Trumaine Johnson (franchise tagged) over Janoris Jenkins (now a Giant). Johnson’s the more reliable person and player. He’s become very good at squatting on routes to break on balls. Jenkins was that way, too, only with more vacillating results. Johnson can also play man coverage against bigger wide receivers—which isn’t true of many cornerbacks. In Week 14 last season he shutdown Calvin Johnson. Expect Trumaine Johnson to travel with opposing No. 1 receivers this year. 9. The loss of James Laurinaitis will hurt if freakishly athletic fourth-year pro Alec Ogletree can’t play with awareness and patience at his new Mike position. Ogletree showed encouraging growth in this realm last season before fracturing his fibula in Week 4. Where Laurinaitis (now a Saint) was most valuable was in the pre-snap phase, calling checks and audibles. 10. There’s no evidence on film that the Rams D plays dirty. They’re just atypical because their defensive backs hit hard—including in the openfield.